Trust is a fragile thing. Break it even once, and people will never forget. In the food industry, trust is dwindling. Just look to Chipotle. After a major E. coli breakout in late 2015, the company’s profits dropped 44% compared with the same quarter the previous year. And it has since given out millions of coupons to lure customers back with free food. But the company still hasn’t fully restored customer trust. But there is a way to increase trust in the food industry. Blockchain solutions are already up and running in other industries like pharma and gold production — and they are ready to be applied to the food space. Every year, one in 10 people around the world become ill due to foodborne diseases, and approximately 420,000 of them die. Part of the reason we still see statistics like this is because it takes far too long to isolate product recall or contamination issues in the supply chain. Right now, IBM and Walmart are working on a solution for this. They’re improving Walmart’s food tracking abilities in China. Under the company’s current system, the pair estimated that it took days — even weeks — for Walmart to track a package of mangos from the farm to the store. With a blockchain track-and-trace solution, it was traced in seconds. This technology is advantageous for everyone in the industry. When outbreaks of foodborne illness occur, the restaurants or grocery stores that served the food are often left wringing their hands, promising to get to the bottom of it. 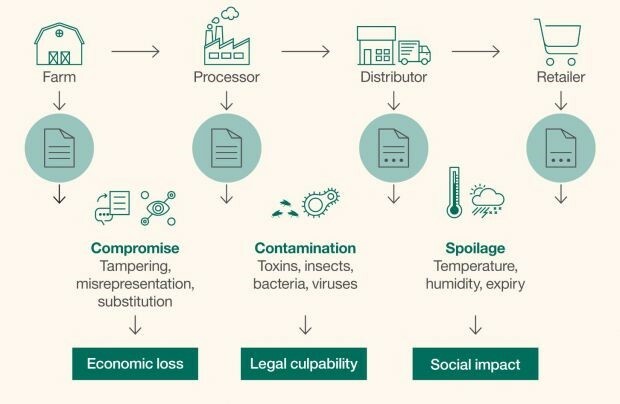 But blockchain track-and-trace will help them immediately track affected items to their origins, locating the issue quickly so they can remove the contaminated products from menus, shelves, and supply chains. For example, let’s say dozens of customers fall ill with listeria after eating at a restaurant chain. The restaurant tests the food and discovers raw vegetables are the culprit. Using a blockchain track-and-trace solution, the restaurant will be able to track the serial number associated with the vegetable shipment back to the distributor and then to their original supplier. If they find the vegetables are contaminated, that supplier will immediately be flagged on the blockchain, and anyone who has sourced or bought the vegetables will be made aware of the danger. A solution like this, of course, is contingent upon two things. First, every crate, shipment, or individual package of produce must be uniquely identifiable. The global standards body, GS1, is leading the way in serialization efforts, offering unique codes called GTINs that can be applied to products for these purposes. Second, that participants in the supply chain must transfer the custody of these products every step of the way. Labeling a product as organic, cruelty-free, or sustainable is a popular marketing tactic. But have you ever wondered what those labels really mean? Who determines if something is organic, how do they do it, and can we trust it? There are companies like Where Food Comes From (WFCF) that confirm product label claims. WFCF focuses on third-party food source verification for dairy, meat, and proteins. Essentially, they put boots on the ground to test different claims in the marketplace. They check the soil to make sure produce can be labeled organic. They check living conditions for animals. They verify those stamps on your granola bars and chicken thighs. But the blockchain will take that one step further, bringing the U.S. food industry together around regulations and consumer demand. Blockchain-based reputation and standards for suppliers will ensure the integrity of the marketing claims. Existing certifications and facility audit reports will be registered on blockchain to prove these claims. And once we have buy-in from participants in the supply chain, we’ll amplify the good labeling behavior of ethical companies, weeding out those who make false claims or misstate the origins of their products through decentralized tracking systems. If consumers know a company’s labeling is backed by a traceable, immutable blockchain system, trust will inevitably increase. Blockchain solutions in the food supply chain aren’t just good for consumers. They will also empower distributors. We have the technology to give farmers and producers real-time access to commodity prices and market data. And when farmers have better information about the marketplace, they can be more competitive and productive. For instance, Block Commodities Ltd. recently announced a partnership with Global Markets Exchange Group International LLP to create a blockchain-based platform for African commodity markets. The platform will help connect farmers in sub-Saharan Africa with buyers and brokers, enabling farmers to get better prices for their crops, as well as reduced-rate loans. The goal is to democratize finance by providing farmers with insight into loan interest rates and commodities prices, all of which will be immutably registered and logged on a blockchain. In the end, more and more people want visibility into what’s inside the products they put into their bodies. They want to be able to make trustworthy food choices for themselves, their families, and their communities. Blockchain technology will help establish that trust.